Support this site with a donation. 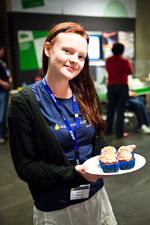 Australia's first SkeptiCamp will be held in Sydney on Saturday, April 30. This will be a BarCamp style unconference where everyone is encouraged to participate and present. Venue is the University of Technology, Sydney, which is close to transport (and Chinatown, for those who like to eat) so getting there is easy. If you live in Sydney or can get there on the day you should really make the effort. Places are limited, so go here without delay to book your place. More information can be found at the SkeptiCamp site. I've already got my ticket. The Performer Pigasus Award, this year for "Best Comeback" - televangelist Peter Popoff. See the full story here. You know how everything natural is good for you? Well, an Australian distributer of something called "Latin Seeds" was ordered to recall all packets of the product because there had been a slight slipup in manufacturing and the magic candlenut seeds had somehow turned out to be oleander seeds, which just happen to be poisonous. 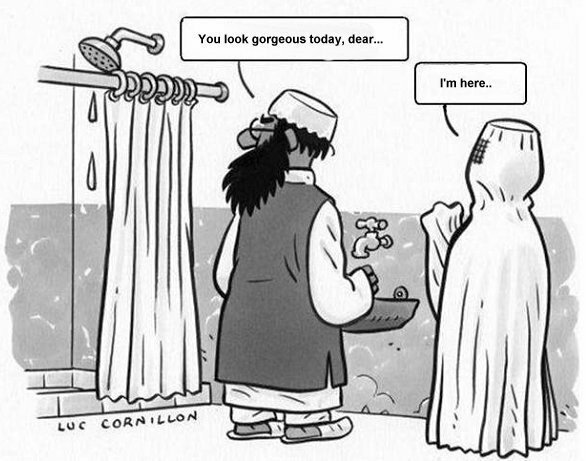 So easy to get them confused. Of course it is all a mistake. 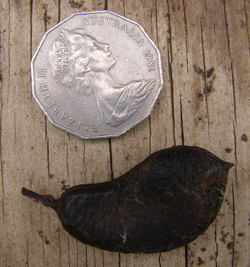 You can see from the pictures above how similar the two seeds are. Now I've stopped being sarcastic I might start asking why there were oleander seeds anywhere near anything destined for human consumption. The only answer I can come up with is that oleander seeds are cheaper so that is what was used to make this "medicine". 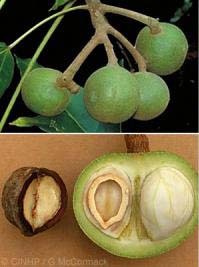 A food marketed for weight-loss, The Latin Seed was recalled earlier this month after government tests revealed it contained poisonous yellow oleander seeds which are prohibited in Australia, and not candlenut as described. "The ACCC is concerned that some health food suppliers may be refusing to provide a remedy to consumers who attempt to return the recalled product," ACCC deputy chair Peter Kell said today. "Both suppliers and consumers should be aware of their rights and obligations under the consumer guarantees that are part of the new Australian Consumer Law. Under the guarantees, consumers have the right to a full refund if a product is not of acceptable quality because it is unsafe." 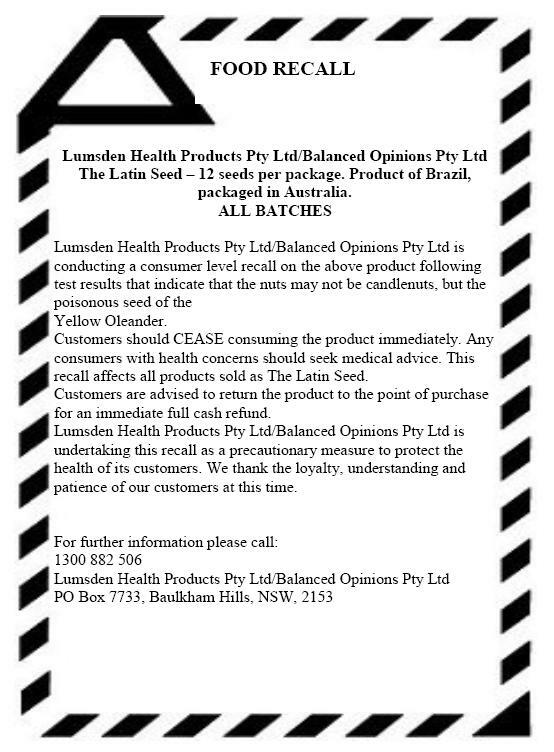 There have been no reports of illness from the product to date, but the distributor has advised consumers to stop eating The Latin Seed, seek medical attention if they feel ill, and to return the product to the point of purchase for a full refund. "Health food suppliers must ensure that their products are safe," Mr Kell said. The ACCC supports the actions of health food suppliers and State and Commonwealth food regulators in the recall of The Latin Seed. You will notice that at least some of the retailers of this rubbish have just as much concern for human life as the people who made the pills and are refusing to make refunds. After all, they know that nothing natural can harm you so any recall is probably just some attempt by Big Pharma to damage their businesses. And in case you bought some of these seeds and didn't see the notice in the papers, here it is. You can tell when it's a slow news day because the television news broadcasts start telling us about idiotic videos that have gone viral for no apparent reason and faces of religious figures appearing in food. The latest has been the face of Jesus seen on a pizza. I suspect that the problem was actually one of hearing impairment. 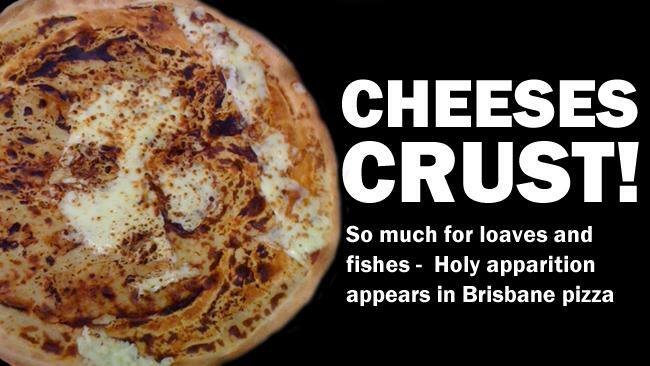 Someone said "This pizza has a mixture of cheeses" and this was misheard as "This pizza has a picture of Jesus". I do like "Cheeses crust", however, and I wish I had thought of it myself. One of the signs of true ignorance is getting little things wrong and not caring about the error. A few weeks ago I saw a comment on one of the anti-vaccination liar pages at Facebook (one of the few that I am not banned from commenting on) which mentioned some research done at "John's Hopkins Hospital". 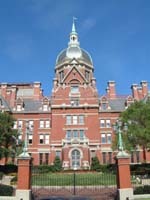 In my usual pedantic style, which irritates idiots and is therefore hugely enjoyable, I asked something like "Where is this John's Hopkins Hospital of which you speak?" I received some drivelous answer which I didn't bother to commit to memory. 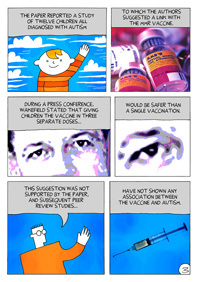 I have now been told that I have been the subject of discussion on the Australian Vaccination Network's Yahoo! mailing list. I am banned from reading or participating in that list but that doesn't stop me being talked about. It seems that I was the subject of ridicule for my question. Apparently I am so stupid that I don't know where "John Hopkins Hospital" is. All I can say to that (here, but not on the list where I am being discussed) is "Where is this John Hopkins Hospital of which you speak?" Idiots. Is it any wonder that they make up and believe the lies about vaccines? A couple of weeks back I listed some alternative medicine web sites that can give the famous Gene Ray's Time Cube a run for its money in the insane web site category. here are a few more. Enjoy, but don't drink coffee near your keyboard while you look at them. Sound Wave Energy - "Are you ready for a Celestial Tune-up? Does your heart resonate with this information? You are the conductor, you have the choice!" Treatment for Brown Recluse Spider bite - "This balm consists of special Native American Magnetic Healing Earth that helps bind and inactivate the poison, Essential Oils and Bee Propolis. It is naturally anti-microbial and skin regenerating. Great for burns and lesions, but specifically directed at Brown Recluse Spider Bites, ESPECIALLY the worse lesions that doesn't heal. This really works to your satisfaction - guaranteed!" Of course there is the question of why you need this if you know about Urine The Holy Water, but even real medicine often has a choice of treatments for the same condition. Summerhill Pyramid Winery - This is not really a alternative medicine site, but it raises the question: "Is a pyramid better than succussion for aligning the essential healing qualities of a medication?" If I were a homeopath I would have a pyramid-shaped office, just to be sure. I've had to reorganise my life this year because the course I was teaching at TAFE was cancelled. Apparently it was not economic to teach computer skills to the people who enrolled because there weren't enough of them. It is good to see that the money that would have been spent on my wages plus the associated costs of running the course such as electricity for the computers and lights, cleaning the classroom, paper and toner for the printer, etc. has been put to good use. Here is a media release dated April 9 from my state department that supports business. A research centre at the University of Western Sydney will receive $75,000 from the NSW Government to provide expert advice to Australian and Chinese herbal medicine companies commercialising their products and negotiating regulation in world markets. The Australian market for complementary medicine, including traditional Chinese medicine, has an estimated value of $3.1 billion per annum and is expected to grow six per cent annually over the next five years. With the world-wide burden of chronic disease and an ageing population, the international market presents even greater opportunities, with international sales of herbal remedies alone estimated at $US83 billion per annum. Executive Director, Innovation, Research & Policy, Kerry Doyle said that the Centre for Complementary Medicine Research (CompleMED) at the University of Western Sydney has been chosen to bring together a team of NSW researchers, regulatory and intellectual property experts to partner with Chinese and Australian herbal medicine companies, research centres and hospitals. "The team will look at the scientific evidence-base of products making high-level therapeutic claims against the regulatory requirements in target countries", Ms Doyle said. "They will also provide companies with expert advice on which products might need further development in order to successfully enter their target international markets". "Initially being run as an 18 month pilot, the program is part of an innovation and technology partnership promoting greater investment and trade between NSW and China. "It will also support the growth of the NSW clinical trials industry, which has been identified as a leading worldwide site to undertake complementary medicine clinical trials," Ms Doyle said. CompleMED Director, Professor Alan Bensoussan will lead the expert team and says the initiative will have a significant and positive impact on the way the sector operates internationally. "Chinese herbal medicine has shown potential to fulfil therapeutic roles as an adjunct therapy or where there is no suitable pharmaceutical treatment; where the risk profile is better or where herbal medicine is more cost effective," Professor Bensoussan said. "We are delighted to have the support of the NSW Government. This work will assist, in a very targeted way, the research and commercialisation of high quality herbal medicines. "In the longer term, it will deliver a model for broader collaboration and engagement in the therapeutic and commercial development of a range herbal medicines. "No herbal medicine sold in Australia, North America or Europe is permitted to make a therapeutic claim to treat or manage a serious disease without substantial scientific evidence. "Australia has stringent quality, safety and efficacy regulatory requirements administered by the Therapeutic Goods Administration that are internationally recognised, and NSW is well-placed to capitalise on the opportunities in the sector," he said. I've had to reorganise my life this year because the course I was teaching at TAFE was cancelled. Apparently it was not economic to teach computer skills to the people who enrolled because there weren't enough of them. It is good to see that the money that would have been spent on my wages plus the associated costs of running the course such as electricity for the computers and lights, cleaning the classroom, paper and toner for the printer, etc, has been put to good use. The state government has just announced a grant of $75,000 to the University of Western Sydney to research better ways to sell Chinese medicines. Not research into whether they work, but how to sell them to more people and how to exploit the fine print of regulations covering the sale of snake oil. We don't need better marketing of ineffective nonsense. And we don't need the government to waste the salary of a teacher or a nurse to pay for the marketing. Today I had a true experience of allopathy. Yes, medicine as practised back in the 18th century when Samuel Hahnemann invented the word "allopathy". I didn't feel better afterwards but I put this down to a healing crisis, you know, that feature of many alternative treatments where you get worse after the treatment as the toxins leave your body. In fact I felt worse, and I was extremely tired and a little confused. Still, I am back to normal now so the treatment must have worked. Did you see what I did there? True allopathy, justification for it making me feel bad, false correlation because now I feel better. Anecdote. Do it. You know you want to. Sorry, I forgot to mention the actual allopathic treatment. It was blood letting. I had half a litre of blood let out of me at the blood bank. I've done this many times before without any reaction so I don't know what was different this time, although the fact that I have been sleeping less than usual during the week because of the demands of the training course I'm attending might be a factor. Perhaps it was the natural intra-personal variation that drives so much of the claimed effect of magic alternatives to real medicine. I probably saved someone's life today. (The Red Cross say that each blood donation saves an average of three people.) How many homeopaths can say that? Just in case you missed it, this has been World Homeopathy Awareness Week. This is a week when much publicity is given to the fraud that calls itself homeopathy so that people can be aware of how ridiculous it is and keep their hands well away from their wallets when charlatans start asking for money for sugar pills and water. I have had people try to tell me that homeopaths really want to help people and that is why they offer to treat diseases. I'm sorry - anybody involved in the manufacture of homeopathic nostrums knows the truth - there is nothing there that can have any effect, and in fact they don't even bother to go through the motions of making the stuff according to what it says on the label. Does anybody seriously believe that somebody actually performs the 800+ manufacturing steps required to make a 200C pillule when all they have to do is take the tiny sweets from a bulk container, put them in a little bottle and then charge 15 cents each for them? All homeopathy is fraud. All of it. Without exception. And the people selling it know this. If they don't then they must be too stupid to tie their shoe laces. Please note that I am not casting doubt on the sanity or honesty of people who are lied to by homeopaths and fall for the lies. I don't blame the victims, I blame the perpetrators. the decision about whether or not to vaccinate should be made in consultation with a health care provider. THE Bangalow-based Australian Vaccination Network Inc (AVN) has launched a civil suit against the Health Care Complaints Commission (HCCC) in the NSW Supreme Court. The suit was lodged in response to the HCCC's public warning about the AVN in July last year. The case is listed for directions and will be mentioned for the first time in Sydney today. The mention will involve case management only at this stage. When contacted by The Northern Star, AVN president Meryl Dorey said she was unable to comment on the matter. The AVN is challenging the findings of the HCCC's investigation into the Northern Rivers-based vaccination information group. The HCCC launched its investigation after it received two complaints about the AVN. The first was from Stop the AVN president Ken McLeod and the second from Toni and David McCaffery, whose baby daughter died from whooping cough in 2009. The HCCC's investigation established on July 26 last year that some information on the AVN website was "misleading and incorrect" and that it "should not be read as medical advice." In response to the HCCC findings, the AVN accused the HCCC's cinvestigation of being biased. Mrs Dorey previously told The Star that the whole investigation was handled in an "extremely irregular manner". Following the HCCC's warning, the NSW Office of Liquor, Gaming and Racing (OLGR) revoked the AVN's fundraising authority after finding the organisation had breached NSW charity laws. The revocation took effect on October 20 last year and the then-Minster for Gaming and Racing Kevin Greene said the group "breached charitable fundraising laws and potentially misled the public". The revocation meant the AVN was no longer permitted to accept charitable donations. The AVN is now fighting that decision through the Administrative Appeals Tribunal, which will hear the matter on May 18 and 19. A spokesperson for the OLGR said his department's revocation took into account the HCCC's warnings. "We will observe the Supreme Court proceedings against the Commission to ensure that any relevant matters are considered," he said. 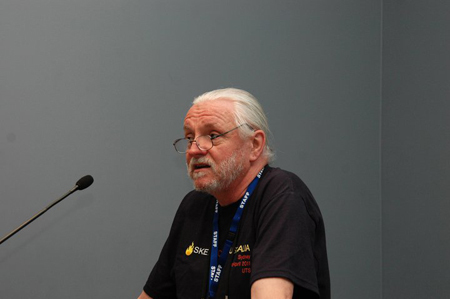 Ken McLeod is not "Stop the AVN president". In fact, SAVN has no officers. The founder was Daniel Raffaele. It's the "Administrative Decisions Tribunal", not "Administrative Appeals tribunal"
In the breakout on the website it gives an incorrect date of death for Dana McCaffrey. It was March 9, 2009. The paper has been notified of these errors. A directions hearing was conducted before Registrar Bradford in the Supreme Court on April 13, and I will be following Case Number 201100098303 closely as it proceeds through the labyrinth of the law. Every now and then I see that I might have made a difference. Here is an article from August last year. I received a fax addressed to my business this week offering to arrange my Yellow Pages listing and, as a bonus, give me a free Google listing. Free submission to Google - how could I resist that? Easily, as it turns out. Apart from the fact that submission to Google is free anyway (and I have an automated process which reminds Google each month about all sites I have anything to do with), I noticed a couple of very large red flags waving. A telephone directory usually has more than one page, so I was intrigued by the name "Yellow Page". Surely it should be "Yellow Pages". And why was the logo giving me a two-finger salute, something which is offensive in many cultures? Perhaps I should go and look at what appears on the Yellow Pages web site. Hmmm. It looks a bit different, doesn't it? Telephone directories are usually produced by your local telephone company, and in the case of Australia they come from a company named Sensis, which is a subsidiary of the biggest telecommunications company, Telstra. (Telstra actually owns the trademarks.) The third red flag was that the fax had come from someone in Manchester, UK. Now while Manchester might be famous for its soccer team, I don't think that Sensis or Telstra have moved their offices to that wonderful smoky paradise. What amazes me is that anyone can fall for such a transparent scam, but there must be a significant number. Unlike email spam, sending faxes isn't free so whoever thought this one up must have thought that an investment of real money was worth it. The fine print includes agreeing to payments totalling $3096.00 so even a 0.1% response rate would be highly profitable. And you can't get out of the contract! I think I have found the reason for the logo with two fingers pointing upwards. It's not to get around trademark law, it's to show contempt for anyone who deals with the crooks. They just give you the sign before they steal your money. Oh, and how does $129 per month compare to the cost of having a listing in the real Yellow Pages? It doesn't actually, because there is no cost to be in the local book other than the cost of line rental and you sort of have to have that anyway to have a telephone number. Or put another way, free beats $129 per month every time. If the scamsters want to take me on for displaying their logo and calling them names they should be aware that the owners of the real name and trademarks have deep pockets and very vicious lawyers. And they have been told about the scam. And here is a media release from the Australian Competition and Consumer Commission. The Federal Court in Melbourne has imposed penalties totalling $2.7 million against two overseas companies, Yellow Page Marketing BV (YPM) and Yellow Publishing Limited (YPL), for sending thousands of Australian businesses misleading faxes and invoices in an attempt to obtain subscriptions to their online business directories. The ACCC alleged that between May 2010 and November 2010, YPM and YPL misled thousands of businesses into thinking they were dealing with Sensis Pty Ltd Yellow Pages®, a business well known around Australia. The YPM and YPL companies sent faxes and invoices that contained the words 'Yellow Page' and a 'Walking Fingers' logo. "This is a significant outcome and represents the highest penalty to be handed down since civil pecuniary penalties were introduced as part of the Australian Consumer Law," Australian Competition and Consumer Commission chairman Graeme Samuel said. "These proceedings are a warning to companies both here and overseas that the ACCC will not tolerate this type of conduct and will seek substantial penalties," Mr Samuel said. In her reasons for judgment, Justice Gordon noted that the traders involved in this directory scam had hectored businesses, demanding payment of invoices and threatening the imposition of late fees. It is important that businesses affected by this scam understand that the court's orders (described below) mean that they can now ignore any demand for payment and stop making payments to these companies. While making orders as to refunds the court did note the real possibility that the parties may not comply. This is because the case reveals this directory to be a scam run by overseas entities, and it is therefore unlikely that any real assets can be tracked down. The court declared that YPM and YPL had contravened sections 52 and 53 of the Trade Practices Act 1974* as neither of the companies are in any way affiliated with Sensis Pty Ltd Yellow Pages®. YPM and YPL to pay the ACCC's costs. On 1 January 2011 as part of Australian Consumer Law amendments the Trade Practices Act 1974 was renamed the Competition and Consumer Act 2010. During the week I came across this 2003 paper about the value of vaccination. I am constantly told that there is no evidence for the efficacy or usefulness of vaccines and I don't think this is going to convince the people who make a living out of lying about vaccines, but it is a useful resource for thinking people who recognise truth. While most agree that vaccination is one of the most important public health practices, vaccines continue to be underused and undervalued, and vaccine-preventable diseases remain a threat to world health. Perhaps one reason this gap remains is that decision-making generally is made on a vaccine-by-vaccine basis. There has been less attention to the value of vaccination in general. To more clearly identify this value, this paper reviews the cost-effectiveness literature and calculates the annual benefits of vaccination on a global scale. One day the disgraced and disgraceful Andrew Wakefield will fade from view and nobody will take his child-killing advice any more. 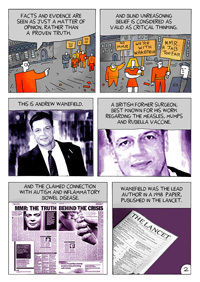 While we wait for that glorious day, have a look at Darryl Cunningham's excellent comic strip about the Wakefield saga. Click on any of the pictures to go there. I was all set to write a piece about my conversion from non-believing Christian to non-believing atheist this week, and then I saw Christopher Hitchens' apology for not attending the American Atheist convention. I wish I could write like this. Sadly, I fear that we are very close to losing someone very valuable, and I hope that when the time comes we can all face the end with such dignity and commitment to our principles. Nothing would have kept me from joining you except the loss of my voice (at least my speaking voice) which in turn is due to a long argument I am currently having with the specter of death. Nobody ever wins this argument, though there are some solid points to be made while the discussion goes on. I have found, as the enemy becomes more familiar, that all the special pleading for salvation, redemption and supernatural deliverance appears even more hollow and artificial to me than it did before. I hope to help defend and pass on the lessons of this for many years to come, but for now I have found my trust better placed in two things: the skill and principle of advanced medical science, and the comradeship of innumerable friends and family, all of them immune to the false consolations of religion. It is these forces among others which will speed the day when humanity emancipates itself from the mind-forged manacles of servility and superstition. It is our innate solidarity, and not some despotism of the sky, which is the source of our morality and our sense of decency. That essential sense of decency is outraged every day. Our theocratic enemy is in plain view. Protean in form, it extends from the overt menace of nuclear-armed mullahs to the insidious campaigns to have stultifying pseudo-science taught in American schools. But in the past few years, there have been heartening signs of a genuine and spontaneous resistance to this sinister nonsense: a resistance which repudiates the right of bullies and tyrants to make the absurd claim that they have god on their side. To have had a small part in this resistance has been the greatest honor of my lifetime: the pattern and original of all dictatorship is the surrender of reason to absolutism and the abandonment of critical, objective inquiry. The cheap name for this lethal delusion is religion, and we must learn new ways of combating it in the public sphere, just as we have learned to free ourselves of it in private. Our weapons are the ironic mind against the literal: the open mind against the credulous; the courageous pursuit of truth against the fearful and abject forces who would set limits to investigation (and who stupidly claim that we already have all the truth we need). Perhaps above all, we affirm life over the cults of death and human sacrifice and are afraid, not of inevitable death, but rather of a human life that is cramped and distorted by the pathetic need to offer mindless adulation, or the dismal belief that the laws of nature respond to wailings and incantations. As the heirs of a secular revolution, American atheists have a special responsibility to defend and uphold the Constitution that patrols the boundary between Church and State. This, too, is an honor and a privilege. Believe me when I say that I am present with you, even if not corporeally (and only metaphorically in spirit...) Resolve to build up Mr Jefferson's wall of separation. And don't keep the faith. That is the title of a controversial play by Australian playwright Alan Seymour. It was first performed in 1961 and created a storm because it was seen as critical of ANZAC day, Australia's day for remembering those who served and died in the wars that the country has participated in. One of the characters expressed the opinion that the day shouldn't be used to celebrate sacrifice but to reflect on nationalism and its dangers. Since that time we have become very comfortable with what the day means to us, and the play is studied in schools. Just hope that as we remember Servicemen and women today we remember the Australia they fought for - wasn't gay marriage and Islamic! Wallace has offered what he claims is an apology but he hasn't bothered to remove the message from Twitter. In fact, he hasn't really apologised at all, just apologised for saying it on ANZAC Day as if it wouldn't be offensive on any other day. I have an uncle I never met because he didn't come back from Borneo; my father served in a medical unit and could not go into the Australian War Memorial in Canberra because it reminded him of men who died in front of him. These men, and the tens of thousands of others who served, didn't go to war over who could marry whom or which god people should pray to, although they did fight for the right for stupid people like Jim Wallace to say offensive things. This bigot manages to get the ear of senior politicians, but perhaps now they will think twice before taking any notice of what he says. This is the 21st century, and it is about time that hateful, bigoted medieval thinking was given the respect it deserves. 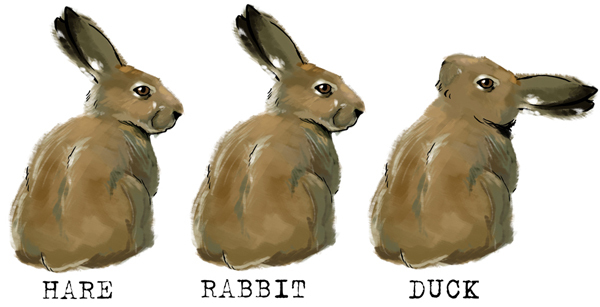 Which is none. I occasionally mention the apparent lack of knowledge of logic that I see in people who try to convince me that red is green and I should accept assertions without evidence. I have written about why it is often futile to debate people who either accidentally or deliberately abuse or ignore the rules of logic. 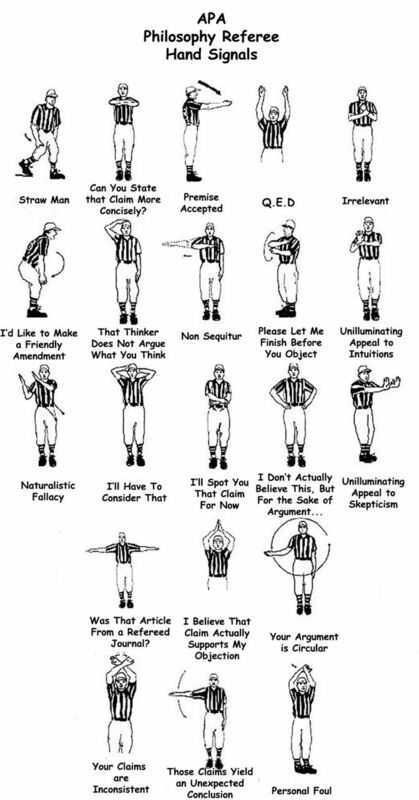 Now someone has come up with a suggestion about how such debates could be refereed. The latest edition of Australasian Science magazine should be winging its way to your letterboxes or newsagents about now with my Naked Skeptic column headed "Confirmation bias, denialism and Morton's Demon". It's about how resilient false beliefs can be, and you can read a sneak preview here. The weather is starting to get cold around my place in the mountains, so I might have to soon start thinking about what I wear when I write future columns. Being naked is fine in the warmer months but I like to at least wear furry slippers when it's snowing outside. While I have writing stuff in the front of my mind I should get on with the five assignments I have due in the next week for the management course I'm doing, plus writing my speech for Skepticamp next Saturday. It's just as well I don't have anything else to do, isn't it? This will be the world's shortest update. I've got a major assignment for the course I'm doing due on Monday (no, I am not working at the last minute - we weren't given the final information needed until last Thursday) and all day Saturday had to be dedicated to Skepticamp, reported below. And I do mean all day - I live a two-hour train trip from the venue and that meant a 6:35am train in the morning and a 12:18am train from Sydney to get home. There was some delay after the conference caused by everyone going to an after-event party, which is how I happened to need the last train west out of town before the railway goes to sleep for the night (and I didn't even doze off and miss my stop at about 2am). Normal transmission will be resumed shortly. The first Skepticamp held in Australia was a roaring success, and huge thanks and congratulations have to go to Jason Brown, Dave The Happy Singer and Esther Trenowden for doing all the hard advance work, Jasmine Marosvary for sitting with a video camera for most of the day and to all the volunteers who pitched in on the day. The event achieved what I have seldom seen at a conference - it started and ended on time, all the speakers were interesting (with two concurrent streams it was impossible to see every one, but I didn't hear a single complaint), the speakers stuck to their time limits, nothing went wrong with the technology and the catering for lunch was excellent. I'm looking forward to the next Skepticamp, which will be in Melbourne in September if everything goes according to rumour and plan. Videos of the presentations made in the larger room will be on YouTube shortly and there will be full reports of what went on appearing on various web sites and blogs over the next few days, so I won't write a full report today. 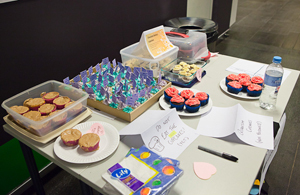 There has been a long tradition starting at Barcamp Canberra of running a simultaneous CupCakeCamp, where people bring cakes along for judging by the conference attendees. This side event was very capably organised by Bea Bowditch and Bronwyn Pinchbeck, and the winner was Ruth Ellison from Canberra (who also took the Skepticamp photos you see on either side here - Creative Commons copyright and all that). Unfortunately my entry suffered a disaster during transportation and couldn't be exhibited, but as I donated the prize for the competition I couldn't have won even if the awesomeness of my cooking had been displayed on the table. I gave two talks. One was planned, scripted, PowerPointed and tested for timing, and the other one was ad hoc, ad lib and used to fill a gap in the schedule. As both seemed to be equally well received I suppose that means that I don't have to prepare for any speeches I give in the future and should just go in there and make it up as I go along. Actually, it doesn't mean that at all and we have all suffered through conference speeches where the speaker did just that. In this case I talked about something that I know a lot about and have been talking about for years, but If I had been scheduled to talk on that topic I would have worked on it beforehand. Has anyone here ever been sued? I have, and it's not a pleasant experience. Many of you here will be familiar with the action brought against Simon Singh by the British Chiropractors' Association. His sin was to say in an article in The Guardian newspaper: "the British Chiropractic Association claims that their members can help treat children with colic, sleeping and feeding problems, frequent ear infections, asthma and prolonged crying, even though there is not a jot of evidence. This organisation is the respectable face of the chiropractic profession and yet it happily promotes bogus treatments". The BCA eventually withdrew, but it cost Simon a lot of money. He was lucky in a way, as he is a best-selling author and could afford the costs without being personally ruined, but we aren't all in that fortunate position. 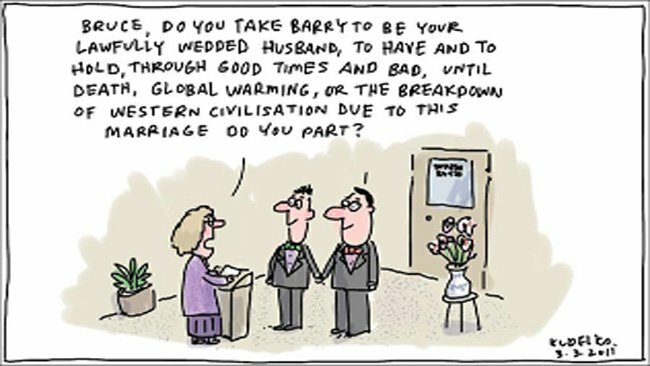 For many of us even a brief appearance in court would make a severe dent in our savings. This has got to be a joke, right? 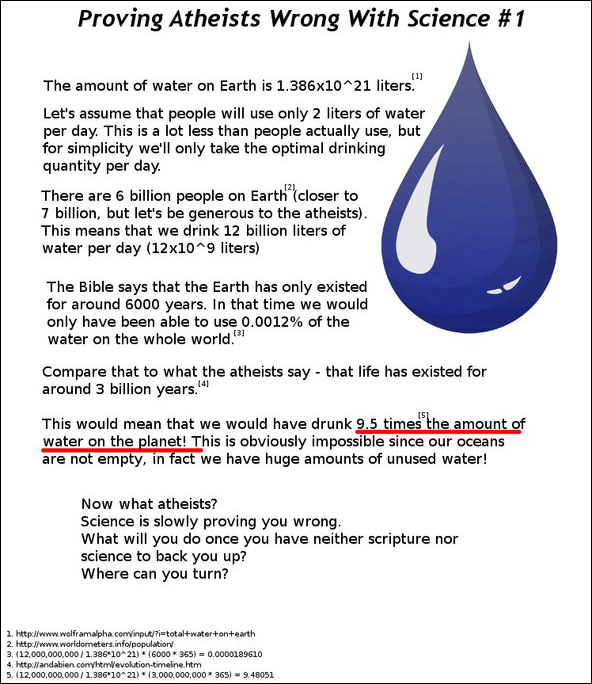 Could it be possible for someone to be so stupid and still be able to turn on a computer and produce this? 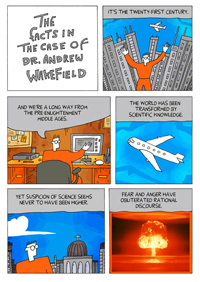 I suspect that it's a Poe, but my prejudices would love for it to be something actually produced by a creationist. The Sci-ənce cartoon site has gone to the great bit bucket in the sky.